When Graham Reznick and Larry Fessenden landed the gig to write Until Dawn in 2011, it seemed easy enough: write some dialogue! Known for working on horror films like House of the Devil and The Innkeepers, the writers had taken on a bigger task than they thought—they were signing on to write two games in four years. “We’ve written 10,000 pages of dialogue,” said Fessenden, when I spoke to the duo last week. Wait a minute. The behind-the-scenes material included with Until Dawn had pegged the game’s script at 1,000 pages. What’s the deal? “I think someone at Sony didn’t believe us,” said Reznick. The biggest reason for Until Dawn’s mammoth script was the lengthy development. When Until Dawn was revealed at Gamescom in 2012, it was a first-person action game for Sony’s Move controller. I broke down the differences in a previous story, but when the game disappeared for years, it wasn’t clear how far along it was. According to Fessenden, it was basically done. Sony and Supermassive decided to put Until Dawn under the knife, and while they kept many of the foundational elements—characters, general setting, horror cliches, etc.—the way players interacted with the story was changed completely. The first-person perspective, along with the game’s many combat and puzzle elements, were ditched entirely and story length was trimmed. Mike and Jess’s cabin romp was responsible for Reznick and Fessenden joining Until Dawn, actually. The two were asked with writing a scene before they were hired, and much of what they worked into that original pitch carried over into the game that shipped earlier this year. 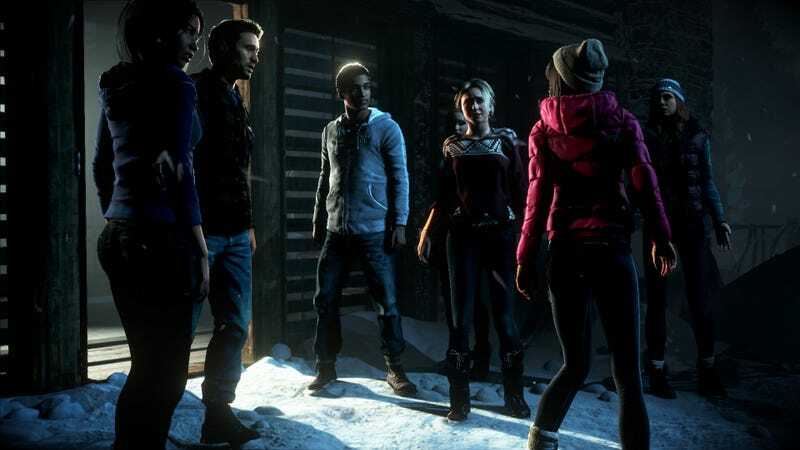 What attracted them to Until Dawn was a growing frustration with modern horror audiences. Fans today, they argued, have grown up in an age of genre deconstruction—Scream, Cabin in the Woods—and, as a result, feel smugly superior to the characters they’re watching. To pull this off, the game had to make you care about the characters. Until Dawn’s archetype rolodex runs deep: There’s the dumb blonde (Jessica), the final girl (Sam), the token minority (Matt), and many others. If you’ve watched a few horror movies, you’ve seen this lineup before. There are some mild Until Dawn spoilers that follow. Emily, for example, is set up as the crabby woman who makes everyone else’s life miserable. The general consensus amongst fans is that Emily is that most difficult character to like, but a smaller group has rallied around Emily, especially given how her arc plays out later in the story. This was my experience with Jessica. When I realized the reason she was strutting her body around was to mask her own insecurities, I realized she was more interesting than your average sexpot cliche, and I wanted her to live. Reznick said the game’s choose-your-own adventure setup is what allowed for these nuances to be explored. In a more traditional slasher film, you might never give the character a chance to express these feelings; the film’s momentum might not allow it. I actually managed to keep Jessica around for a while, until one wrong move—why did I think it was OK to walk down a hallway alone?—put her in danger and her jaw was forcibly removed. One dramatic shift in the game’s script was due to technological advances in shifting to the PlayStation 4. The 2012 version, built for the PS3, had the characters spend a lot more time explaining their actions, but when motion capture was integrated thanks to the PS4’s higher horsepower, it was clear the actors’ expressions could carry some of the burden. The writers ditched other character details because they just didn’t work. Ashley, for example, used to be a drug addict who would go around the house pretending she was in an Agatha Christie novel. What?! The actual process of writing the game was bizarre, too. Even besides the fact that the process took Reznick and Fessenden over four years, the game’s branching paths meant the writers were constantly juggling parallel universes in their head. They handled this by using a flow chart that kept track of how each character should feel based on what had happened to them. (I asked to see a screenshot of this, but was turned down.) Complicating matters was the order of development. Games are not made linearly, and Until Dawn’s script had to accommodate. The first section they wrote, for example, was the game’s eighth chapter. Any ideas, Until Dawn fans? Since the game’s release, the two have delighted in watching fans align themselves with one character or another and begin to develop their own stories about them. Maybe this will lead into an Until Dawn sequel, maybe not. The fans certainly want it, but we’ll have to see how Sony feels about the game… and how well it sells. Reznick and Fessenden spent four years and change working on the first one. Hopefully we won’t have to wait that long for another set of teenagers to get terrorized.